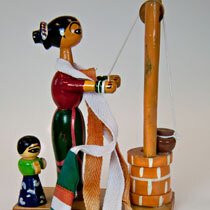 Handcrafted wooden figure of a woman and child in India standing at a well. 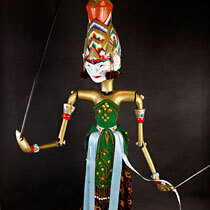 The figure is created with polished wood that is hand painted. Behind the woman, a small child is standing. 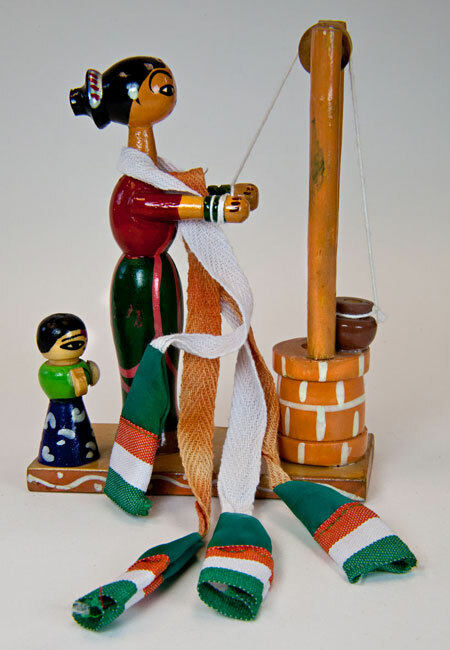 The woman has a large cloth scarf around her neck in the colors of the Indian flag. 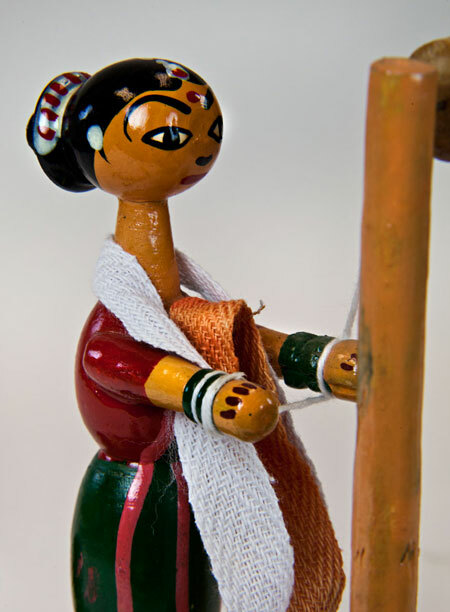 This figure was handcrafted in Tamil Nadu, India. Tamil is one of the 29 states in India. It is located at the southernmost part of the Indian peninsula. 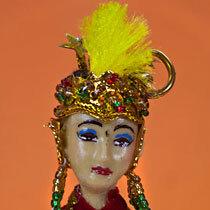 Read the story to learn more about this culture. 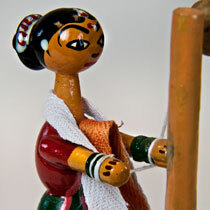 My name is Prisha and I live in southern India. We live a quiet life on a farm, where we try to grow enough food for the family. We, like most other people in India, are Hindu. One day, when Mother and I were getting water from the well, I saw a wild elephant in the river. I knew it was a male because he had beautiful, long ivory tusks. He also seemed to be traveling alone (which female elephants rarely do). I was very surprised to see a wild elephant – it is a rare sight. The Hindu and Buddhist people in India respect elephants, and would never dream of hurting them. However, there are many poachers who hunt and kill elephants because their ivory tusks are so valuable. Thus, the number of wild elephants has decreased a lot over the years. Quickly, I ran home to tell my grandfather about the elephant. He told me that when he was young, wild elephants roamed the countryside in large herds. In fact, he had seen many baby elephants. Baby elephants are blind when they are born, and they weigh over 200 pounds! The young elephants stay with their mothers and the other females in the herd until they are about 15 years old. Then the males leave to start their own herds. He said that elephants love to swim, and were often seen in the rivers and lakes. They have enormous appetites and eat trees, bushes, leaves, grasses, and fruit. When elephants were plentiful in this area, it was a big problem for farmers. They would eat a lot of the crops and trample the grasses. In fact, Tata (Grandpa) can remember his dad working with a community patrol group. When elephant herds threatened the crops, they would guard the farm fields. It was dangerous work because elephants are so strong. However, they could usually scare them away with loud noises and bright lights. 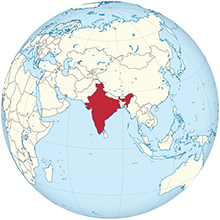 The elephants in India and Asia are smaller than the elephants in Africa. They also have smaller ears, but they still have a great hearing and a powerful sense of smell. Tata walked back to the river with me to see if the elephant was still there. He said that many feel that seeing an elephant is a sign of prosperity and good luck. When we got to the river, the elephant was nowhere in sight. I think Tata was relieved that it had moved on to a less populated area. He said that elephants are born to be free. It pleased him to know that at least a few elephants are still able to live in their natural surroundings.